‘Carnival’ is celebrated in many countries. While its origins may be in the Catholic and Eastern Orthodox faiths, it draws on the hedonistic feasts of Ancient Greece and Rome. Millions of revellers come together for one big party. The word ‘carnaval’ comes from the Latin ‘carne valle’ which literally means goodbye to meat. This is because festivals normally take place just prior to Ash Wednesday. This is the day of fasting and repentance that marks the beginning of Lent. Here are just a few of the world’s greatest carnivals. The best known and biggest carnival is that held in Rio de Janeiro in Brazil. Famous since the 1930’s, every year the parade of samba dancers in their elaborate costumes gets bigger and more impressive. Celebrations take place between 13 – 16 February. They begin with the crowing of the Fat King, who receives a giant key from the city’s mayor. 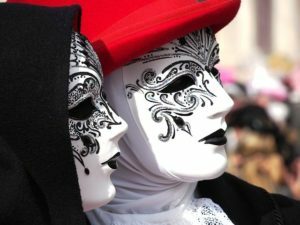 Italy also celebrates carnival with a flourish! The best known celebrations take place in Venice, with numerous masquerade balls and parties. Starting two weeks before Ash Wednesday, the carnival ends on Fat Tuesday. Grand masked balls have given rise to the famous Venetian Mask which allows participants to party without fear of recognition. Our very own Notting Hill Carnival definitely deserves a mention. Staged for two days every August, this carnival has been attracting visitors and participants since 1965. Consequently, it’s now the second largest street event in the world! Originating from Trinidad, the calypso beats and steel drums draw in over a million visitors every year. 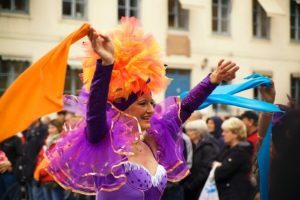 Around 60,000 people take part, with dancers, floats and a general fun party atmosphere. Once banned by the Spanish dictator Franco, the Santa Cruz de Tenerife Carnival is one of the biggest in the world. It starts with an opening parade and the election of a Carnaval Queen. The Queen and her Maids of Honour are driven through the streets accompanied by ‘Murga’ in clown costumes. Midway through the festival on Ash Wednesday comes the Burial of the Sardine. This is where a giant papier mache sardine parades through the streets and burns upon reaching the harbour. The carnaval closes with the Gran Cosa Apoteosis, where participants throw eggshells and cloth balls at parade windows overlooking the route. Just about anything goes at the Santa Cruz carnival. Participants often appear in drag and festivities don’t start until well past midnight! And finally we can’t talk about the world’s greatest carnivals without mentioning Mardi Gras in New Orleans. A celebration of music and parades this carnival has a specific colour scheme of purple, green and gold, symbols to represent justice, power and faith. They take place for two weeks leading up to Fat Tuesday or Mardi Gras in French. Truly one of the most spectacular carnivals in the world.